Being gluten-free doesn't mean you can't have wonderful things to eat. Enjoy! In the bowl of your stand mixer, place the flour, cream of tartar, instant yeast and sugar, and use a handheld whisk to combine well. Add the salt and whisk to combine well. Add the evaporated milk, vinegar, shortening and eggs, and mix on low speed with the dough hook until combined. Raise the mixer speed to medium and knead for about 5 minutes. The dough is a lovely, smooth enriched dough. Spray a silicone spatula lightly with cooking oil spray, and scrape down the sides of the bowl. Transfer the dough to a lightly oiled bowl or proofing bucket large enough for the dough to rise to double its size, spray the top of the dough with cooking oil spray, and cover with an oiled piece of plastic wrap (or the oiled top to your proofing bucket). Place the dough in the refrigerator for at least 12 hours and up to 3 days. ** **Note: If you prefer, you may make and use this dough on the same day. It will not be as easy to handle, but you can still work with it. To use it the same day it is made, after making the dough, cover it as directed and set it to rise in a warm, draft-free environment to allow it to rise to double its size (about 1 hour). Once it has doubled, place it in the refrigerator for at least 15 minutes or until it is chilled. This will make it much easier to handle. Then, continue with the rest of the recipe instructions. Preparing the dough for shaping. On baking day, line a rimmed baking sheet with unbleached parchment paper, spray it with cooking oil and set it aside. Turn out the chilled dough onto a lightly floured surface and, using the scrape and fold kneading method and using a very light touch, sprinkle the dough with more flour and knead it lightly, sprinkling with flour when necessary to prevent it from sticking, scrape the dough off the floured surface with a floured bench scraper, then fold it over on itself. Repeat scraping and folding until the dough has become smoother. Do not overwork the dough or you will incorporate too much flour and it will not rise properly. Shaping the dough. Turn the dough out onto a lightly floured surface. Sprinkling lightly with flour as necessary to prevent sticking, roll it out into a rectangle that is about 1/2-inch thick. Spray a large piece of unbleached parchment paper generously with cooking spray, and transfer the dough to the greased paper. With a floured rolling pin, continue to roll out the dough into a rectangle about 1/4-inch thick and about 12-inches square, sprinkling very lightly with flour as necessary to prevent sticking. With a pizza wheel, pastry wheel or sharp knife, trim any ragged edges to create a proper square. Slice the rectangle into 12 3-inch squares. Transfer the squares to the prepared baking sheet, placed about 1 inch apart, and cover loosely with an oiled piece of plastic wrap. Set in a warm, draft-free location to rest and rise slightly for about 20 minutes. Fry the beignets. While the dough is finishing its final rise, place about 3 inches of frying oil in a large stockpot. Over medium-high heat, use a candy/frying thermometer and bring the temperature of the oil to 325°F. For best results, keep a close eye on the temperature of the oil and maintain the proper temperature in between batches of frying dough. Uncover the risen dough and place the worst-looking beignet in the hot oil and fry until light golden brown all over (about 1 minute per side). The dough will puff up as it fries. If the dough browns too quickly or fries in a speckled fashion, the oil is too hot. Remove from oil and drain on paper towels. Place the remaining 11 beignets in the hot oil in batches of about 2 to 3 until light golden brown (about 1 minute per side). Drain on paper towels. After all of the beignets are fried and while they are still warm, sprinkle both sides liberally with confectioners’ sugar. 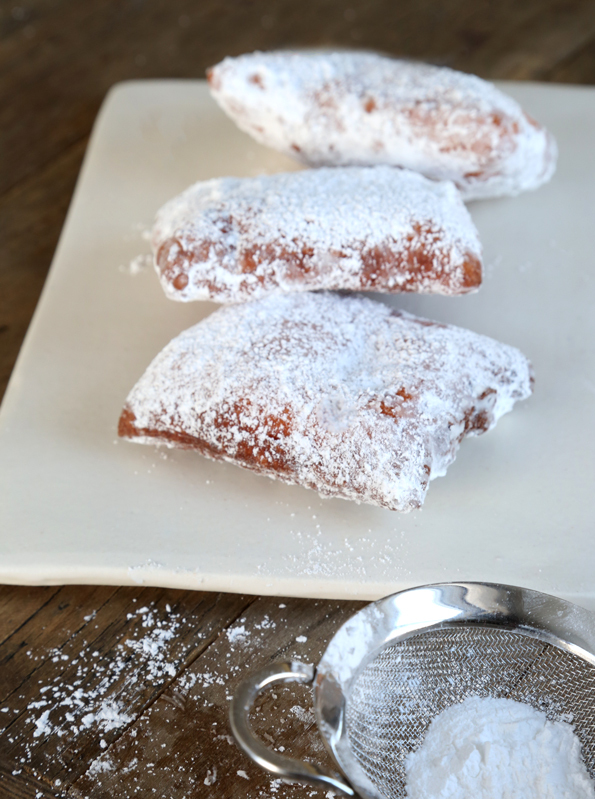 If you would like to cover the beignets very evenly and completely with confectioners’ sugar, place the sugar in a large zip-top plastic bag, and then place the warm beignets in the bag about 4 at a time. Seal the bag, shake vigorously, then remove the beignets from the bag. Serve immediately.